This isn’t a review, just a kind of an enthusiastic recommendation for the book. I’ve read it twice. First time was about 10 or 12 years ago. I discovered it at Audible.com maybe 5 or 6 years past. This is the second time I’m listening to it and just thought I’d relate what a fantastic experience it is. 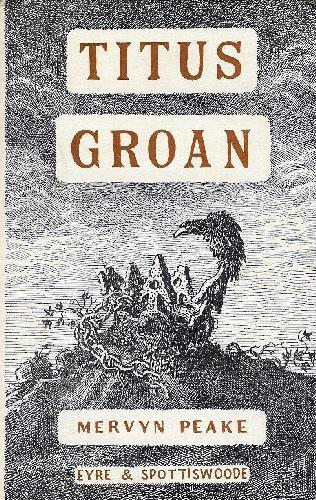 Published in 1946, Titus Groan – I’ve just finished it and once more started on it’s companion Gormenghast (ISFDB references here and here) – are master classes in descriptive writing. Mervyn Peake’s prose is filled with incredible, original, often beautiful (and sometimes bizarre) similes and metaphors. His use of color is unparalleled. The only authors that I have read that come even close are H.P. Lovecraft and C.L. Moore, and with them he shares a certain dark foreboding feel behind the words, though with perhaps, slightly less gravity. Mr Peake has, as I’ve read variously around the Internet, been accused of not developing his characters fully. Indeed, this might be true. I feel though, the more traditional or literary method of characterization through background, inner thoughts and motivations isn’t necessary. Here, characters are described more in terms of their actions, affectations and appearances rather than their personalities. A technique that, because of Mr Peake’s rare skill in painting a picture for one’s mind’s eye, is incredibly effective. The ability to really connect with the characters does, I suppose, suffer because of this, but the sheer enjoyment of actually seeing the characters and roaming the stretches of stone corridors and the various rooms and locations within and without the great castle is something to experience. Let me give you a small taste of what I mean. The following passage is how the book opens – our introduction to what has been said to be the principal character of the tale: Castle Gormenghast itself. I’m taking these from the audio version, so apologies for any errant punctuation as compared to that in print. Gormenghast, that is the main massing of the original stone, taken by itself would have displayed a certain ponderous architectural quality were it possible to have ignored the circumfusion of those mean dwellings that swarmed like an epidemic around it’s outer walls. They sprawled over the sloping earth, each one halfway over it’s neighbor until, held back by the castle ramparts, the innermost of these hovels laid hold on the great walls, clamping themselves thereto like limpets to a rock. These dwellings, by ancient lore, were granted this chill intimacy with the stronghold that loomed above them. Over their irregular roofs would fall throughout the seasons, the shadows of time-eaten buttresses, of broken and lofty turrets, and, most enormous of all, the shadow of the Tower of Flints. This tower, patched unevenly with black ivy, arose like a mutilated finger from among the fists of knuckled masonry and pointed blasphemously at heaven. Outstanding. The last sentence has stuck in my mind since I took it in upon the first reading. “..arose like a mutilated finger from among the fists of knuckled masonry and pointed blasphemously at heaven.” Awesome. Swelter’s eyes meet those of his enemy, and never was there held between four globes of gristle so sinister a hell of hatred. Had the flesh, the fibers and the bones of the chef and those of Mr Flay been conjured away and away down that dark corridor leaving only their four eyes suspended in mid air outside the Earl’s door, then surely they must have reddened to the hue of Mars. Reddened and smoldered and at last broken into flame, so intense was their hatred. Broken into flame and circled about one another in ever narrowing arcs, and in swifter and yet swifter flight, until merged into one sizzling globe of ire they must surely have fled, the four in one, leaving a trail of blood behind them in the cold gray air of the corridor until screaming as they fled between innumerable arches and down the endless passageways of Gormenghast, they found their eyeless bodies once again and retrenched themselves in startled sockets. This is just so over the top that I can’t help but mentally rock back and forth while (again, mentally) clapping my hands in delight. Anyway, I highly recommend these books. They are a reading experience that you will not quickly nor easily forget. The versions from Audible.com are fantastically voiced, the reader gives each character very skillful and appropriate vocal characterizations and this technique, while I normally dislike in audio books, really works well here and adds to the experience. This entry was posted on July 22, 2010 at 6:06 pm and is filed under Audio Books with tags Gormenghast, Mervyn Peake, Titus Groan. You can follow any responses to this entry through the RSS 2.0 feed. You can leave a response, or trackback from your own site.